§ 8. 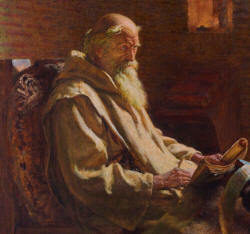 AND when he now began with care to meditate on his intended entrance to a more rigid course of life, God’s grace was revealed to him, whereby his mind was strengthened in its purpose, and it was shown to him by the clearest evidence, that to those who seek the kingdom of God and his righteousness, the bounty of the divine promise will grant all other things also, which are necessary for their bodily support. For on a certain day, as he was journeying alone, he turned aside at the fourth hour into a village which lay at some distance, and to which he found his way. Here he entered the house of a pious mother of a family in order to rest himself a little, and to procure food for his horse rather than for himself, for it was the beginning of winter. The woman received him kindly, and begged him to allow her to get him some dinner that he might refresh himself. The man of God refused, saying, “I cannot yet eat, for it is a fast day.” It was the sixth day of the week, on which many of the faithful, out of reverence to the Lord’s passion, are accustomed to extend their fasting even to the ninth hour. The woman, from a motive of hospitality, persisted in her request; “Behold,” said she, “on the way you are going, there is no village, nor house; you have a long journey before you, and cannot get through it before sunset. Let me entreat you, therefore, to take some food before you go, or else you will be obliged to fast all the day, and perhaps even till to-morrow.” But though the woman pressed him much, his love of religion prevailed, and he fasted the whole day until the evening. § 9. When the evening drew near, and he perceived that he could not finish his intended journey the same day, and that there was no house at hand in which he could pass the night, he presently fell upon some shepherds’ huts, which, having been slightly constructed in the summer, were now deserted and ruinous. Into one of these he entered, and having tied his horse to the wall, placed before him a handful of hay, which the wind had forced from the roof. He then turned his thoughts to prayer, but suddenly, as he was singing a psalm, he saw his horse lift up his head and pull out some straw from the roof, and among the straw there fell down a linen cloth folded up, with something in it. When he had ended his prayers, wishing to see what this was, he came and opened the cloth, and found in it half of a loaf of bread, still hot, and some meat, enough of both to serve him for a single meal. In gratitude for the divine goodness, he exclaimed, “Thanks be to God, who of his bounty hath deigned to provide a meal for me when I was hungry, as well as a supper for my beast.” He therefore divided the loaf into two parts, of which he gave one to his horse and kept the other for himself; and from that day forward he was more ready than before to fast, because he now felt convinced that the food had been provided for him in the desert by the gift of him, who formerly fed the prophet Elias for so long a time by means of ravens, when there was no man to minister unto him, whose eyes are upon those that fear him, and upon those who trust in his mercy, that he may save their souls from death, and may feed them when they are hungry. I learnt these particulars from a religious man of our monastery of Wiremouth, a priest of the name of Inguald, who now, by reason of his extreme old age, is turning his attention, in purity of heart, to spiritual things rather than to earthly and carnal affections, and who said that the authority on which his relation rested was no less than that of Cuthbert himself.